Cover illustration by Vincent di Fate. Kip lives on a science research station on a planet whose official name is Paradise, but most people call it Purgatory. The planet has many life forms, most of them highly dangerous, but as Kip grew, he learned from his Uncle Mike how to deal with the dangers, helped by the station service dogs, and helped even more by a voice that speaks in his head, a female voice he knows as Gwen. Gwen gives him help and information, but has cautioned Kip to keep her existence completely secret, even from Uncle Mike, and he’s done so. Kip’s schoolmates sometimes wonder how he knows so much, and why he gets that faraway look before answering questions, but no one has guessed his secret. Kip’s parents died when he was an infant under mysterious circumstances. Uncle Mike knows, but won’t tell him. Gwen also seems to know, but says she’s not allowed to tell him until he reaches a certain age. Paradise is essentially owned by a giant Earth corporation, and Starswarm Station is their nod to science and the environment. The scientists primarily study the giant plants known as Starswarms like the one near the station. Others are in the sea and elsewhere. 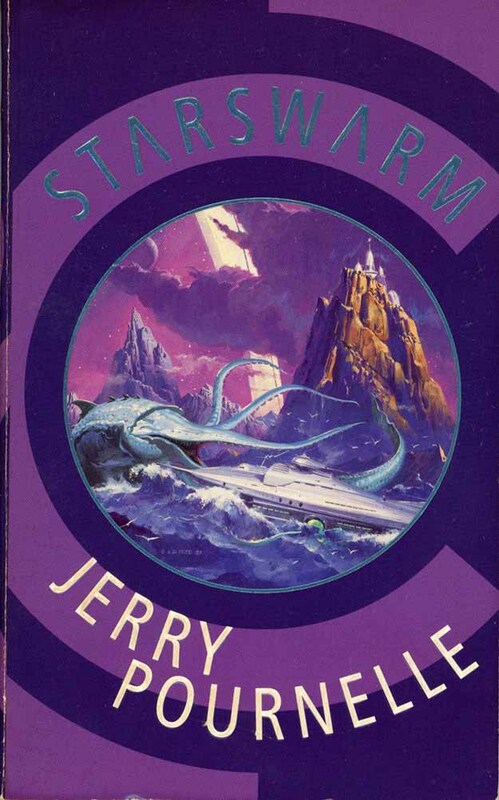 When corporate shenanigans bring threats to the station’s Starswarm, Kip and his friends try to protect it, and before long are deep in trouble that forces them to hide out in the wild areas outside the station. Gwen is, at last, able to tell Kip more about what’s really going on, but things keep escalating, and it seems Kip himself is somehow at the center of a massive secret power struggle he doesn’t understand. Will his friends and new allies among the creatures of Paradise be enough to save him? In his introduction, Pournelle makes it clear that this book is an homage to the novels for young readers of Robert Heinlein, and I’d say it’s a satisfying example of just that. It starts a bit slow, but the pace of the story accelerates steadily, and soon I was finding it hard to put down. Pournelle has some more modern scientific ideas to work with than Heinlein, and he handles them well, but the characters and the story itself are the real draw. This entry was posted in Books, Reviews on December 6, 2018 by Todd.